El Niño information encompasses much more than just an El Niño forecast as an early warning of potential harm for some countries and of potential benefit for others. This page considers how to use El Niño knowledge for sustainable development. Disaster Risk Reduction (DRR) involves a concern for the future, as opposed to disaster response and recovery (drr) which tends to focus on the “here and now.” El Niño knowledge can be used as a bridge (link) between DRR efforts (e.g. prevention and preparedness) and sustainable development (e.g. resilience, mitigation and adaptation). Bridging would make explicit the need to broaden concern from one primarily focused on a forecast of the onset of an El Niño event and then, once an event has “locked in,” focus on the behavior of El Niño during the rest of its lifecycle. The latter involves focusing on a specific El Niño at a given place and time. 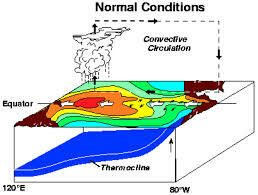 That involves using all available information about El Niño including not only a forecast but also historical, traditional, indigenous and anecddotal accounts of El Niño-related socioeconomic impacts that resulted from past any of the hydromet hazards that an El Niño might have spawned such as droughts, floods, fires, or infectious disease outbreaks. For example, people and governments in Mexico, Peru, the Philippines, and Australia have been coping for a long time with droughts and floods, a notable percentage of which are now known have been related to El Niño. Thus, there is considerable knowledge of its foreseeable consequences, much of it unreported, unrecorded or unpublished or buried in gray literature and reports about El Niño impacts and responses at the local level. Preparing for known, recurring, foreseeable (but not certain) hydromet hazards requires a blended approach that directly encourages those working in sustainable development planning and those agencies involved in DRR planning to work very closely together. There are many definitions of sustainable development, including this landmark one which first appeared in 1987: “Development that meets the needs of the present without compromising the ability of future generations to meet their own needs.” (from the World Commission on Environment and Development’s (the Brundtland Commission) report Our Common Future (Oxford: Oxford University Press, 1987). The reality is that these are complex, political decisions about the kind of lives we want to lead and the kinds of society we want to live in. What exactly does this mean? What are the needs of the present? For example, what happens when a company’s need for cheap labor conflicts with workers’ needs for livable wages? Or when individual families’ needs for firewood conflict with the need to prevent erosion and conserve topsoil? Or when one country’s need for electricity results in acid rain that damages another country’s lakes and rivers? How do we decide whose needs are met? Poor or rich people? Citizens or immigrants? People living in cities or in the countryside? People in one country or another? You or your neighbor? The environment or a corporation? This generation or the next generation? When there has to be a trade off, whose needs should go first? One way that El Niño can contribute to sustainable development by pointing policy makers toward reoccurring hazards that are likely to occur and to threaten the well-being of their citizens, prompting them to focus on DRR efforts to cope with foreseeable threats to their longer term development efforts. As suggested in the following short video, the goal of those concerned about disaster risk reduction is to create a culture of prevention and not to perpetuate a culture of reaction to climate, water and weather related hazards.